August to October 2015 was election season in Canada. During this time, politicians traded blows, pundits talked themselves hoarse and one thing became immediately clear: none of the parties have a plan in line with the science of climate change. With a collapsed price of oil, a summer of historic wildfires and a media that finally seems be ready to talk about climate change, we have a perfect recipe for climate to be front and center during the Canadian election. Yet, while emissions and temperatures was rising, the ambition of Canada’s political parties just wasn’t. At the end of the election period, it was certainly heartening that Stephen Harper lost his seat as Prime Minister — under his leadership, Canada had become an international pariah on climate change. Newly elected Prime Minister Justin Trudeau is certainly a promising leader in many ways — he has promised to make climate change a national priority once again. 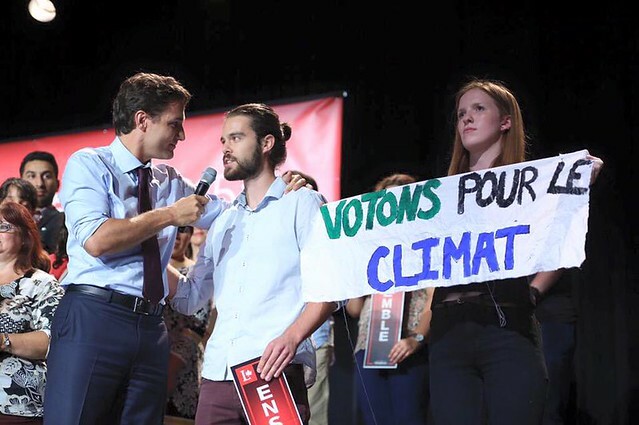 However, Trudeaus also stands in support of major tar sands pipelines, and right before he was elected, the co-chair of Trudeau’s election campaign was revealed to be a consultant for TransCanada. That’s why, right after Prime Minister Trudeau was elected, people across the country took bold and courageous action by sitting-in outside his residence for his first four days in office. A surprise awaited ticket-holders at the leaders debate in Toronto. Read more about the mobilization at the Foreign policy debate as well as a summary of climate issues during all of the leaders debates. In French, a summary and pictures of the breathtaking mobilization that took place outside of the leader’s debate in Montreal. We were starting to get a bit tired off the party leaders bending the truth when it came to climate issues so we decided to fact check the leaders after the French debate. Close to the two month mark for this election period, people power stepped it up with some bold mobilizations. In French, a summary of the key highlights from the debate on the economy. People took action and the politicians talked in circles — in case you missed it, we summarized the climate highlights from the leaders debate on the economy. There was a surprise delivery at the leaders’ debate on the economy in Calgary and people across Canada took action to crash the social media stream. In French, a summary of why people are mobilizing to demand action during the federal election. Mulcair and Trudeau were on the hot seat and Harper received a proper East Coast style welcome. Traditionally, politicians in Canada have ignored the climate question — but not this time. Find out why. Canada is complicit in perpetuating the refugee crisis in Syria. It’s time to take responsibility. In French, the actions that made it impossible to ignore climate change in this election. A migrant justice organizer got arrested at a Conservative event and Justin Trudeau had to answer to some visitors. A social media summary of the courageous and creative actions that forced climate change onto the campaign trail. Stephen Harper silences messages about climate change and Trudeau calls climate organizers to the stage. A little bit of creativity has gone a long way in this election. Wherever federal leaders go, messages about climate change follows them. 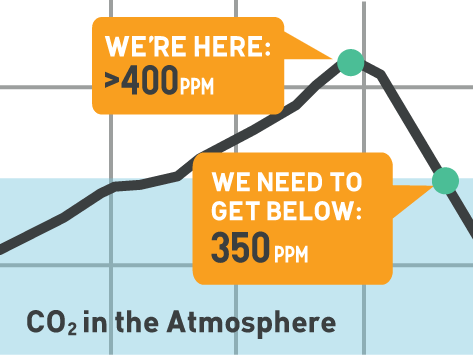 The election period kicks off with a series of actions demanding climate leadership. All of this started off with an ambitious plan — read more.